This IBM Redbooks publication describes the basic installation of FLEX-ES (a product of Fundamental Software, Inc., Fremont, California) with several z/OS operating system packages. Much of the material is in cookbook format. 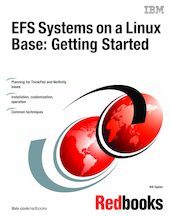 More advanced techniques and options are described in "S/390 PartnerWorld for Developers, ITSO/EFS Project EFS Systems on a Linux Base: Additional Topics", SG24-7008. These books are intended primarily for members of the IBM PartnerWorld for Development organization and for internal IBM users of the ITSO/EFS package. This second edition includes the latest updates to the first edition of this book. It also contains more information about using Red Hat 9.0 with FLEX-ES Release 6.2.14.